Modern pickup trucks are expected to deliver workhorse performance without compromising comfort and technology. These powerful and practical vehicles have made strides from the bare-bones models of past years, and the GMC Sierra has been one of the leading models in the pickup truck segment. 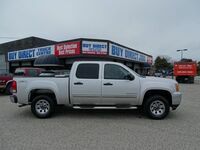 If you are looking for a used GMC Sierra 1500 in Kelowna BC, Buy Direct Truck Centre should be your first stop. Used GMC Sierra 1500 models allow car shoppers to take advantage of the impressive performance capabilities this truck offers without a break-the-bank price tag. Used Sierra models can be found with a variety of engine, cab and bed options, making this truck a versatile and practical choice. Comfort and Technology Features: Remote keyless entry, remote-locking tailgate, LED cargo box lighting, Bluetooth, USB and auxiliary connectivity, Apple CarPlay and Android Auto, Wi-Fi hotspot, IntelliLink touchscreen interface, leather-wrapped steering wheel, HD and satellite radio, heated steering wheel, Bose audio system, DVD/Blu-ray player. Safety and Driver Assistance Features: Parking sensors, a rearview camera, trailer sway control, blind-spot mirror, OnStar, forward collision warning system, lane departure prevention and a safety alert seat. A variety of engine options have powered the GMC Sierra 1500. Recent models can be found powered by a staple of the General Motors engine lineup: the 4.3-litre V-6 engine. This engine delivers 285 horsepower and 305 pound-feet of torque. Other engine options that can be found on the truck include a 5.3-litre V-8 engine producing 355 horsepower and 383 pound-feet of torque and a 6.2-litre V-8 rated at 420 horsepower and 460 pound-feet of torque. Regardless of which used GMC Sierra 1500 you find, you will get a powerful and capable pickup truck. Interested in a GMC Sierra 1500?